The jury were unwilling to contradict the surgeons' medical authority. Medical evidence did not persuade the judges, but it did influence the jurors. The role of surgeons in determining the causal relationship of natural illness and violent injury is clearly demonstrated in the trial of Ann Coffin in 1752. Accused of the murder of Mildred Bevill, her domestic servant, Coffin was charged with repeatedly beating Bevill with a stick, poker, and tongs. The trial began with three depositions that detailed how Coffin had viciously abused the victim, who then became ill and died three weeks later. Next the court was read the report of the post mortem conducted the day of the homicide at St. John's. It described three contusions on the shoulders and abdomen which the three surgeons concluded were too small to have caused Bevill's death. John Monier, one of the presiding surgeons, testified that several weeks before the homicide he had been asked to see the deceased, who was suspected of being pregnant, and had noticed some contusions. Monier again treated Bevill shortly before her death for a fever and dropsy which he	judged to be terminal. He told the court that the nurses who had attended her had observed an intestinal infection which was the probable cause of the fever. The rest of the prosecution's evidence challenged the post mortem report and Monier's findings. A jury had viewed the body, and its conclusion—that Bevill had died from wounds and bruises—was noted in the indictment. After Monier's testimony the court heard a deposition from John Hendrick, another surgeon who had treated the deceased but did not attend the post mortem. At Coffin's request, he too had examined Bevill and found a broken arm and symptoms of dropsy. The next day Margaret Ridley, a midwife, determined that Bevill was not pregnant. She confirmed Hendrick's diagnosis and asked Bevill if she had been beaten. The deposition by Ridley recounted attacks that included beatings with iron tongs and wooden planks, as well as episodes of forced confinement and deprivation of food. Statements from two witnesses corroborated Ridley's evidence, while a third claimed that on her deathbed Bevill had blamed Coffin for her illness. 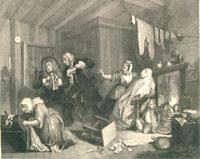 Engraving by G. Presbury, from the original by William Hogarth (1697-1764), and entitled "The Harlot's Progress. Expires While the Doctors are Disputing." From J. Trusler, E. F. Roberts, and James Hannay, eds., The Complete Works of William Hogarth (London: London Printing and Pub. Co., 18--) 112. Yet the case against Coffin was not strong enough to mitigate the surgeons' post mortem report. The prosecution depended largely upon circumstantial and hearsay evidence. Coffin was known to have beaten her servant severely, but the court heard no proof that a specific assault had caused the fatal illness. There were also several references made in depositions to a sexual assault committed upon the victim prior to her illness, which could have caused serious abdominal damage. Although both Hendrick and Ridley described Bevill's injuries, neither asserted that the beatings had caused the homicide. Only the juror's report in the indictment directly linked the beatings to murder, and it proved insufficient to rebut the post mortem evidence and Monier's testimony: Coffin was acquitted. In spite of a prosecution case which included damaging character witnesses, a favourable juror's inquest, and stirring testimony about the deceased's last dying words, the trial jury remained unwilling to contradict the surgeons' medical authority. Similarly, in the trial of John Delaney for murder in 1786, the jury also had to discern between illness or assault as the cause of death. Again the trial jury followed the medical evidence, but in this case the surgeons had ruled the homicide to be the result of violence. Delaney was indicted for beating his wife, by which "mortal strokes and bruises" she had died at Harbour Grace after languishing three weeks. The trial began with two witnesses who described a confrontation between Delaney and his wife, but who did not actually see the assault. Peter Le Breton, the surgeon who had attended Ann Delaney, then testified that on the night of the alleged attack, he had heard shouts from Delaney's house and summoned Patrick Phelan, a Roman Catholic priest. The two intervened and advised Mrs. Delaney to go to a neighbour's house, where she stayed until her death. Le Breton told the court that two days after the incident he was summoned to treat the deceased for severe stomach pains, for which he prescribed a variety of medicines without any noticeable effects. Ann Delaney also complained of chest and throat injuries from the beating, and Le Breton noticed a mark of violence on her throat. In cross-examination John Delaney asked whether the patient had suffered similar problems long before this illness. Le Breton retorted that he had previously treated Mrs. Delaney for a chest contusion, at which time the deceased had told him in her husband's presence that it was caused by a wound she had received from her husband some time before. Q:	Are you of opinion that the state of the intestines might not be occasioned by disease as by external contusion? A:	It might be occasioned by disease, but there was some appearance of contusion in the integuments, and there was also a blackness on the deceased's right side. Q:	Are you of opinion that the situation Mrs. Delaney is described to have been in when attended by Doctor Breton before her decease, might have occasioned that morbid state of the intestines you and the other surgeons described in your report to the coroner? A:	I am of opinion that the morbid state of the intestines might have originated from disease, but there were marks of external violence. (Bannister 1998 119-20). After the surgeons' testimony, the prosecution closed with a witness who reported that, on her deathbed, Ann Delaney had blamed her husband for her death. In defence John Delaney maintained that the deceased's condition was simply a recurrence of "one of her old flights" caused by an unstable character. Before the jury retired the court reiterated serious doubts over the medical evidence. The charge to the jury closely reviewed Le Breton's testimony; it noted that he had seen little or no mark of violence on the deceased when he had treated her for symptoms seemingly unrelated to the assault. The judges contended that the strong medicines, coupled with a prolonged illness, were sufficient to have caused the same appearance of the intestines observed by the surgeons. The address from the bench reiterated other issues, particularly the deceased's "flighty" character, and noted that, on the night of the alleged assault, no one had seen the accused strike the victim "in such as manner as was likely to cause her death." Despite these instructions, the jury found John Delaney guilty of murder. Engraving by E. Smith, from the original design by William Hogarth (1697-1764), and entitled "Industry and Idleness. The Idle 'Prentice Executed at Tyburn." From J. Trusler, E. F. Roberts, and James Hannay, eds., The Complete Works of William Hogarth (London: London Printing and Pub. Co., 18--) 77. As in the Coffin trial, the jury returned a verdict that corresponded to the surgeons' evidence. In this case the judges were unable to raise sufficient doubt over the medical evidence, though they believed that the victim's statement on her deathbed had weighed heavily with the jury. The fact that the beating had caused the homicide, they informed the governor, had not been established by "positive and object evidence." Governor Elliott agreed; he reprieved Delaney and recommended a full pardon. Elliott even went so far as to speculate that "the poor woman fell a victim rather to improper medical treatment than to the ill usage she received from her husband." Thus pressures both within and without the courtroom—particularly contemporary attitudes toward violence against women—shaped how surgeons' evidence influenced the verdict and punishment. Medical evidence did not persuade the judges, but apparently it did influence the jurors, who were willing to exercise remarkable independence. Nevertheless, given its access to the power to pardon, the government had the final say.